Now that we’ve had a few days to review and reflect on the events of San Diego Comic Con (SDCC), it’s time to think about the things we did and the changes we experienced. One of the biggest changes this year was the introduction of RFID badges. RFID stands for radio-frequency identification. It works by using electromagnetic fields to identify and track tags attached to objects. In this case, the tags are inside of your RFID-enabled badge, and the field is generated by the scanners/tapstiles that you have to tap with your badge when entering or exiting the con. Other cons have used such technology in the past, but this year was the first time Comic Con International (CCI) dipped its toes into the RFID waters. 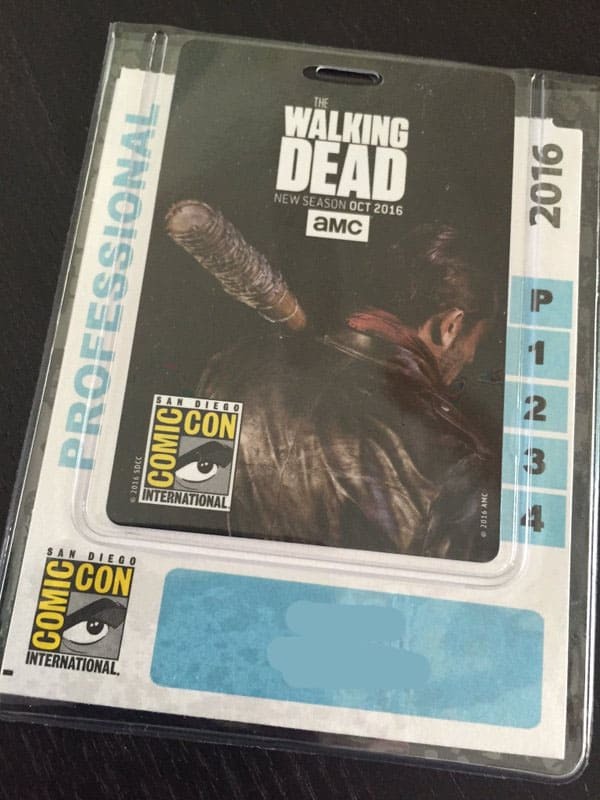 Previous attendees will remember the soft plastic holders and paper badges from prior years. This year, the soft plastic holder and paper cards were increased in size, and a hard plastic card was inserted into the middle. These cards contained the RFID tags. These tags are passive, meaning that they do not transmit anything, and have no power. They do hold a small amount of data, such as your name and badge type, and your contact information. When these badges are placed against the scanners, the scanner’s electromagnetic field powers the tag inside the RFID badge, powering it for a brief moment, allowing the scanner to read the data on the tag. 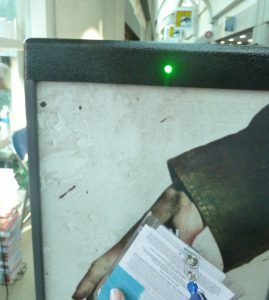 If your badge was valid, a green light appeared. If there was a problem, a red light appeared. A green light means that you’re good to go! At the Talkback session for this year’s Comic Con, John Rogers, President of Comic Con International, stated that the RFID technology used this year was provided by a large company that had worked with a lot of music and concert events, and therefore had experience with large crowds of people. 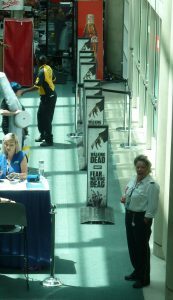 This experience was evident at both WonderCon and San Diego Comic Con, as most attendees have reported few problems, if any, with the RFID system. 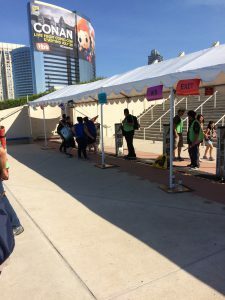 An informal discussion on Friends of Comic Con forum has revealed that the most common problem attendees experienced was that their badge scanned with a red light instead of a green light. In most cases, an immediate rescan (or two) fixed the problem. In a few cases, the scanner itself was broken, and security used handheld scanners to validate badges before letting people through, sometimes with an ID check to match the name on the badge to the person attempting to enter. Overall, such problems were minimal, and reports from both of CCI’s cons this year have generally been positive regarding the use of the RFID technology. RFID scanners on the water side of the convention center. Before the con, many attendees were worried about the need to scan out when exiting the building. If an attendee entered, but did not scan out, then there would be problems the next time they attempted to enter, and they would have to go to the RFID help desk to have their badge reset. However this ended up being a non-issue, as security people were constantly reminding attendees to tap out at the exit points, and the lines at the RFID helpdesk were very short (often no one was there at all). It seems that attendees were able to deal with this issue easily. In an interview with Leonard Sultana of An Englishman in San Diego, CCI spokesperson David Glanzer stated that CCI hoped to use the RFID technology to gauge crowd levels at entry and exit points, in order to attempt to supply more capacity at chokepoints, and/or direct people to alternate scanner locations. It will be interesting to see the results of such analysis next year. I, for one, hope that there will be more scanners and entry points available at the Sails, when the Everything Else line is let in each morning! While most people have had positive experiences with the RFID technology this year, one common complaint is that the scanners were too low, requiring people to bend over at an awkward angle. This issue was brought up at the WonderCon Talkback panel, and at the time, John Rogers stated that they would attempt to raise the height of the scanners, but were limited by the technology used by their provider. From my perspective, it’s possible the scanners at SDCC were higher than at WonderCon, but if so, it wasn’t by much. If the technology doesn’t allow an increased scanner height, then one solution would be for CCI to hand out retractable badge clips, rather than lanyards, to make it easier for people to pull out their badges for scanning. The people I encountered at this year’s con with such clips were quite pleased with this approach to the issue. Overall, it appears that RFID technology has been successfully integrated into SCCC badges, so you should expect to see them for many more years to come. Click here to join the conversation at FoCC!